oh wow, these look cool! I would not mind having a collection of those pieces of craftsmanship myself. I have looked at these, and they potentially save you a lot of work, but its hard to justify $25 to replace a single piece of plastic from the kit. I can see buying these over time. Really wood make the front end pop. Wow! Fantastic looking props, at very un-fantastic prices!!! More power to those that will buy them, but too rich for my wallet! Since I use my hobby to pay for my hobby, I'll sell some 1/35, and convert to money for a select few props. If I buy one or two a month, I get then over time, and with 60 WNW kits, the bite won't be so bad.. 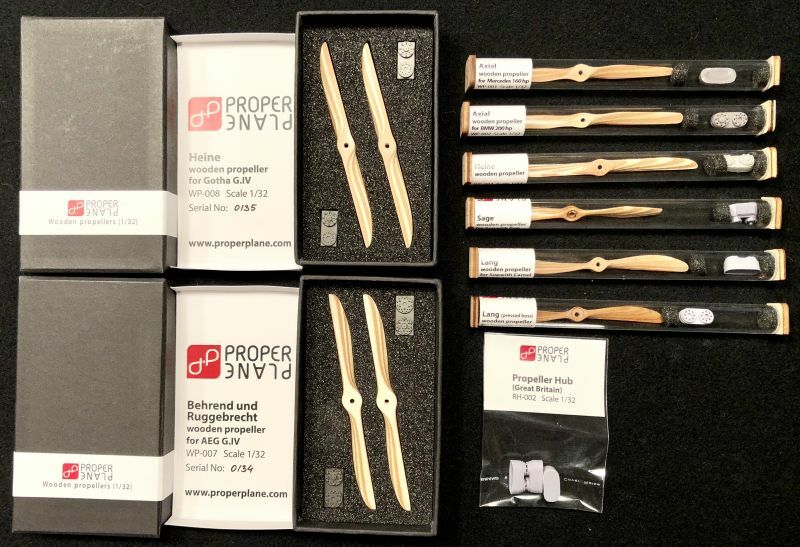 Since I use my hobby to pay for my hobby, I'll sell some 1/35, and convert to money for a select few props. If I buy one or two a month, I get then over time, and with 60 WNW kits, the bite won't be so bad. 60 Wingnut kits? Wow! I have 2, and will probably never buy any more than that. I had 3, and sold off a duplicate for a profit that essentially made one of them free. Tim, I do have some duplicates, and do not even have the full range of WNW kits; some airplanes do not interest me. Prolly won't buy a Dolphin, but will buy two Junkers D1. German stuff tends to be more colorful, so duplicates are OK. If that's what you love, my friend, go for it!! I'm not a primarily WWI guy, but love Fokker DVIIs, and the Pflaz DIIIA really struck me too, so I have both of those, and got smoking deals, so it was worth it for sure! In general, I prefer the very large skeletons for the WWI stuff, like the wooden 1/16 DVII I built a couple years ago, and the 1/16 Hasegawa and Model Airways kits. I'm fascinated by the way they're built. Yes, I have the 1/8 Dr-1 and Camel as well. Your DVII is a fine piece of wood work. Thank you sir! I have a scratch DR.1 planned as well, but need to finish some other projects, first. Maybe this winter?